Can't lose for winning: Or is it the other way around? You’d think that having just reported a pretty good quarter, Apple would be in a good position. Ha. Ha. Haaaaaa. Despite all that’s going right for the tech giant, new signs indicate that Apple could be in a vulnerable spot against competitors. The article does not say over what time period these employees were enticed away but let’s just assume it was in the last 15 minutes so it sounds super bad. ...for Apple’s largest business segment—the iPhone and iPad family—while still high, declined by about 2% between the fourth quarter of 2012 to the fourth quarter of 2014, ending at 20%, according to data compiled by market intelligence firm IDC. And here the Macalope had just heard how Apple was defeating Android. The horny one’s not even going to bother trying to figure out whether it’s Fortune’s Sanghoee or Business Insider’s Jim Edwards who’s making the logical error here. The only important take-aways are that iOS is both simultaneously a dastardly capitalist juggernaut that is destroying the democratic freedom of Android and a total loser that’s bleeding market share. It is the Schrödinger’s cat of mobile operating systems, in which the cat is both dead and destroying your personal freedom at the same time. In addition, the popularity of the company’s phones in China, a large and attractive market with 550 million smartphone users, could be threatened by the recent entry of e-commerce behemoth Alibaba into this segment. Maybe he’s not. Maybe he was laughing maniacally as he wrote this. That could explain it. What this implies is that Apple can’t afford to become complacent. Cut to Tim Cook, lying in sweats on a couch playing Super Mario, his cheeks stuffed with Cheetos. Startled, he looks into the camera: “Whuff?” Cheeto dust flies everywhere. Even though the new iPhone has been wildly successful due to its larger screen size, it’s not dramatically different from its predecessors. It’s apparently not enough that Apple redefined the smartphone market in 2007. It has to do it again every year. Other than minor improvements, the iPhone 6 is almost identical to the iPhone 5S, which in turn is similar to the model before it. That is Apple’s big problem. In order to maintain its position, Apple can’t afford to simply tweak or upgrade its existing line of popular products. Well, isn’t it great they have you to remind them how they do business, which is by reinventing a product category, making the best product they know how to make, and then incrementally improving it after that. 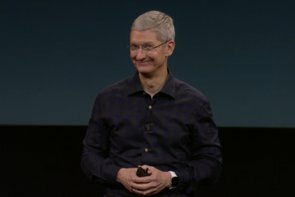 Clearly if there was anyone who didn’t know how Apple does business it would be the people running Apple.